Tainan, Taiwan is famous for its many, many temples. 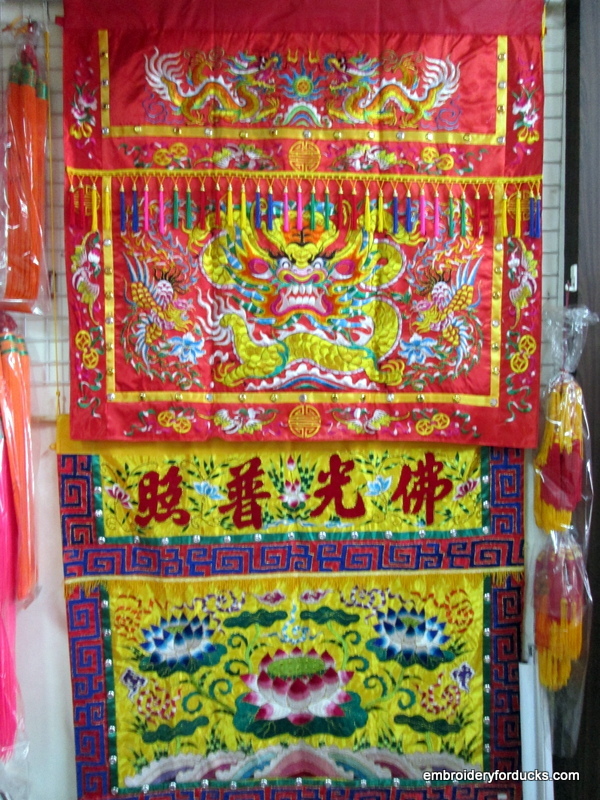 With that many temples filled with statues of deities in need of costumes, walls in need of tapestries, altars, temple doors and gates in need of banners it is no wonder that traditional Chinese embroidery is found in abundance in Tainan. 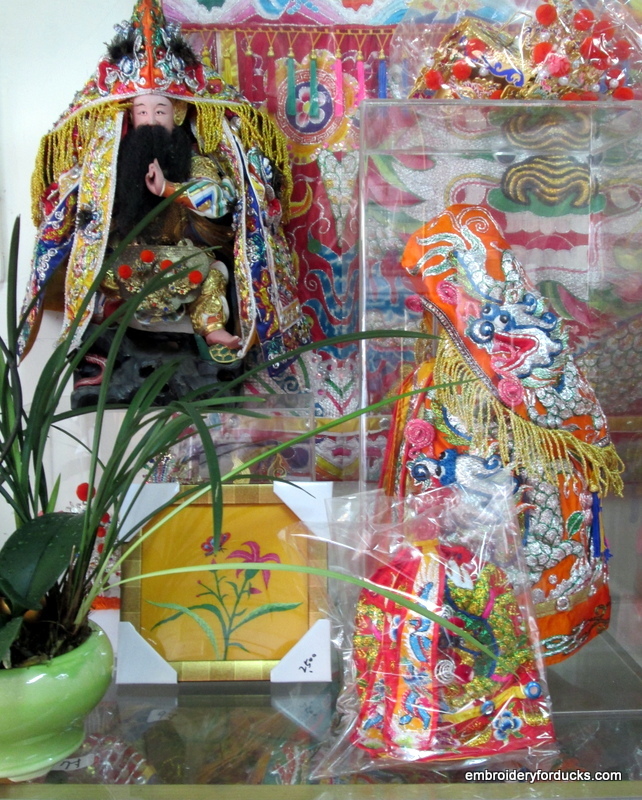 Delicate embroidery adorns the miniature robes and headdress for the small statues. This one is doll size-maybe 1.5 ft (0.46m) tall. 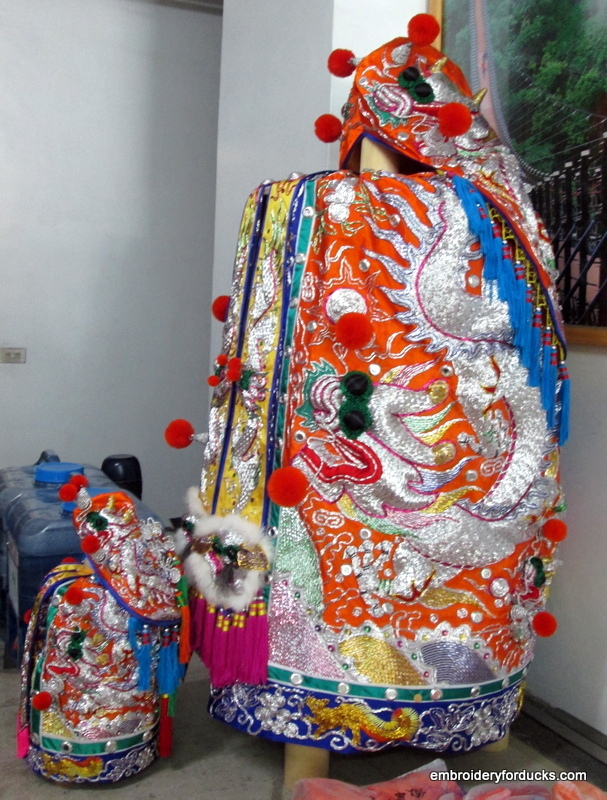 The larger statues of gods, goddesses, and their minions are also elaborately clothed but large or small the embroidery is magnificent. 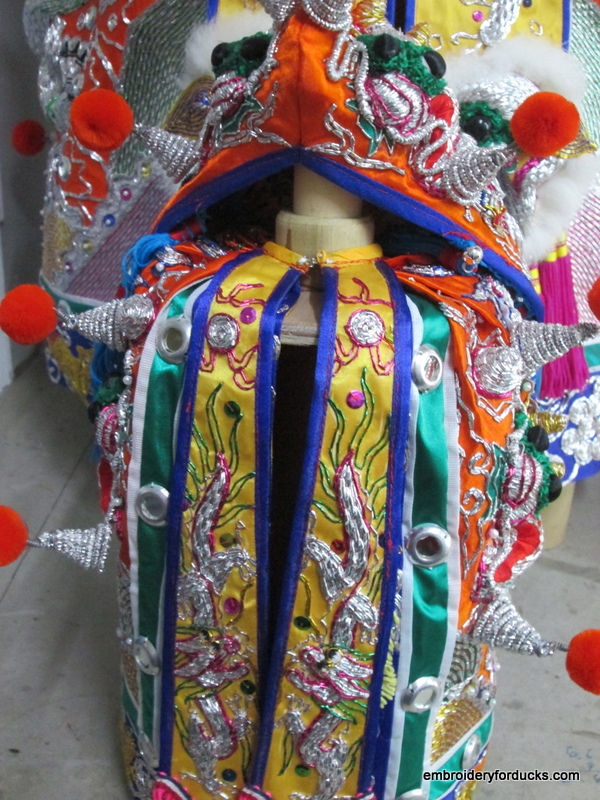 Couched goldwork and silver is used lavishly. Colors are not subdued, pastel, or earthy. Brilliant, glowing, shining materials are used throughout. Silk, satin, gold, silver and pom-poms! 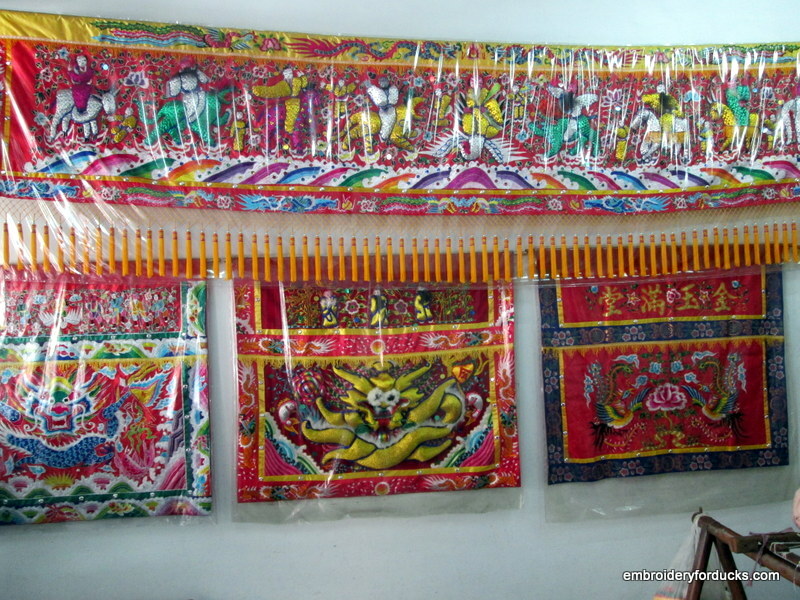 An entire section of the workshop is hung with smaller tapestries one on top of the other. All are the same width, about 5 ft wide (1.5 meters). Then there are the ginormous banners 15-20 ft or longer (4.6 to 6.1 meters). 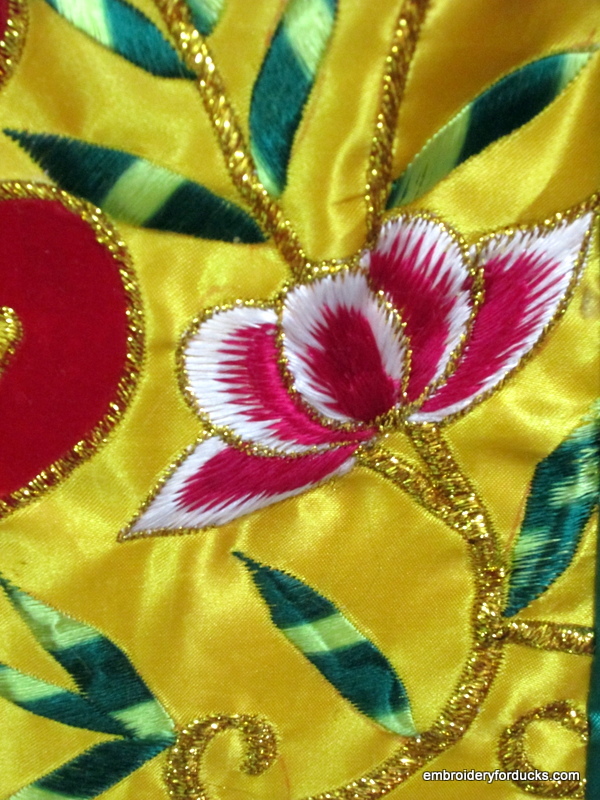 Here is a close up of satin stitch motifs and gold work outlines and stems. Chinese are not afraid of color! 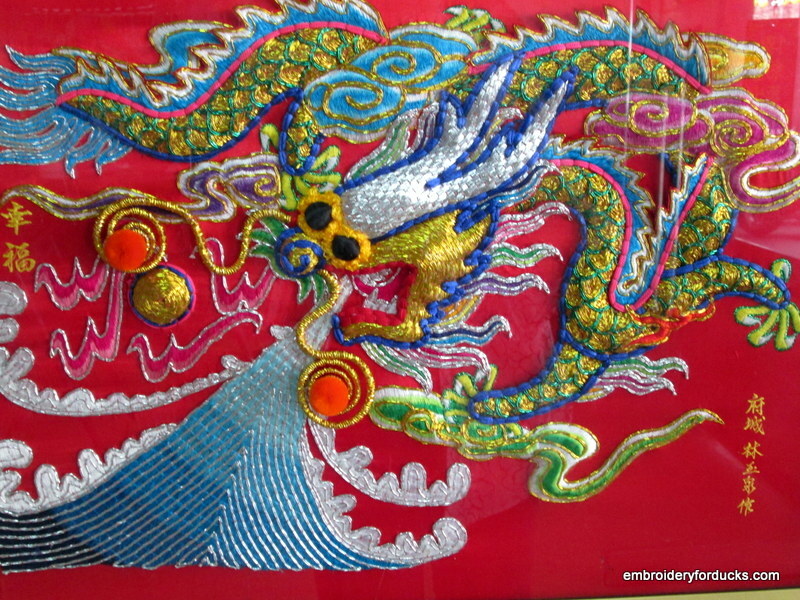 This entry was posted in Embroidery around the world, Mother and tagged embroidery, Needlework, Tainan, taiwan, Temple. Bookmark the permalink. Beautiful embroidery. Very inspiring . Thank you for sharing this great work. These are so incredibly beautiful and intricate. Thanks to your mom for sharing! Wow those are bright and cheery. Lovely! Hi Hannah! I’ve visited the workshop of the chap (and his team) who do many of these pieces. The top one, the dragon, is his favourite design to work. I have a quantity of photos and have been planning to do a post on it, when I’ve finished with the Korean ones.=) Good to see someone else doing Taiwan things! Well, I have two more posts on this workshop to go 🙂 I will be interested to see what you have to say in yours!